More than 20 years of removing and reconstructing old logging roads in the Skokomish River watershed has finally paid off with measurable improvement to water quality and habitat, according to experts with Olympic National Forest where millions of dollars have been spent on restoration. 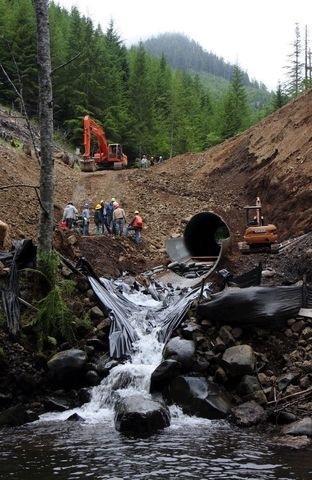 In a U.S. Forest Service project nicknamed “the Big Dig,” contract crews removed nearly 100 vertical feet of road in the South Fork of the Skokomish watershed to remove an eight-foot culvert. The U.S. Forest Service this week declared that the upper South Fork of the Skokomish is now a “properly functioning” watershed, and the major road-restoration projects are complete. After writing for years about horrendous problems with sediment washing out of the upper watershed, this news comes as a nice surprise. I’ve been hearing experts talk about water-quality improvements, but this new declaration is a major milestone in the restoration of the entire Skokomish River ecosystem. “This is a proud and historic occasion for the Forest Service and our many partners who have worked very hard for over two decades to restore this once badly degraded watershed,” Reta Laford, supervisor for Olympic National Forest, said in a news release. 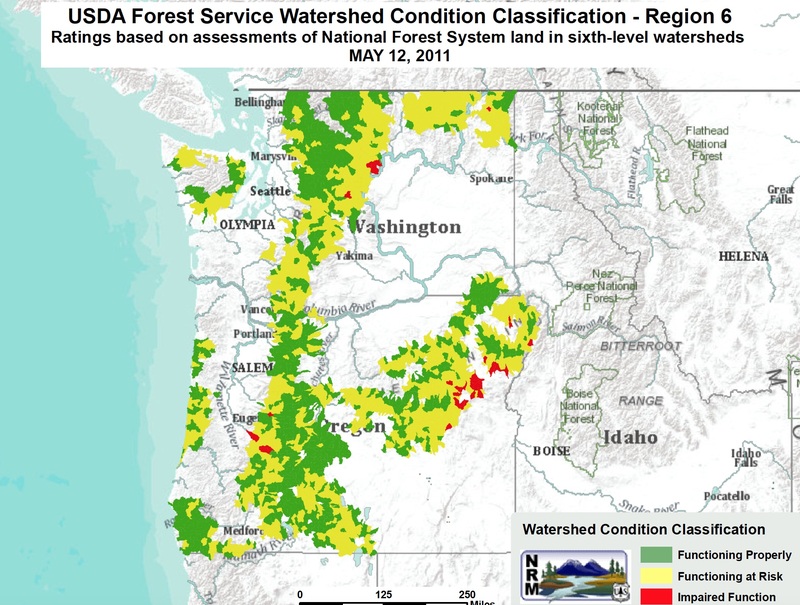 In 2010, the Forest Service classified the South Fork Skokomish as an “at-risk” watershed during a nationwide effort called the Watershed Condition Framework. Several other watersheds in Olympic National Forest also received this designation. See the map at the bottom of this page or download (PDF 5.3 mb) from the Forest Service website. In 2012, Olympic National Forest designated the upper and middle South Fork Skokomish sub-watersheds as “priority watersheds.“ Forest Service officials pushed forward with action plans containing a list of restoration projects designed to put the watersheds on a path to ecological health. Completion of the key restoration projects in the upper South Fork allowed for the new designation as a “properly functioning” watershed. This marks the first time that any watershed in Olympic National Forest has been upgraded due to completion of all essential restoration projects. Watershed conditions and aquatic habitat will continue to improve as natural processes roll on. Restoration in the South Fork actually began in the early 1990s, when the Forest Service acknowledged that the region was criss-crossed by a damaging network of logging roads. At nearly four miles of road for every four one square mile of forest, it was one of the densest tangles of roads in any national forest. In 1994, the Forest Service designated the South Fork Skokomish as a “key watershed” in the Northwest Forest Plan, which called for major cutbacks in logging and received support from President Bill Clinton. Between the early 1990s and 2005, Olympic National Forest completed $10.6 million in restoration work, including $7.9 million for road decommissioning, road stabilization and drainage improvements. In 2005, the Skokomish Watershed Action Team (SWAT) was formed among a coalition of more than 20 government agencies, environmental organizations and business groups with diverse interests. The SWAT developed a unified front for promoting restoration projects and seeking funds. Members agreed that the focus on roads should begin with the upstream segments, later moving downstream, while other work was coordinated on the estuary near Hood Canal. Much of the lower area was owned or acquired by the Skokomish Tribe, a critical partner in the SWAT. Between 2006 and 2015, the Forest Service continued with $13.2 million in restoration projects in the South Fork, including $10.9 million on road problems. In all, 91 miles of roads were decommissioned, closed or converted to trails, and 85 miles of roads were stabilized or improved with new culverts and drainage features. Much of the road restoration work was funded by Congress through the Forest Service’s Legacy Roads and Trails Program. Former U.S. Rep. Norm Dicks was instrumental in creating that program, and congressional support has continued under the leadership of Norm’s successor, U.S. Rep. Derek Kilmer, and U.S. Sens. Patty Murray and Maria Cantwell. Key funding for restoration also has come from the Forest Stewardship program, which uses receipts from commercial timber thinning on forest lands. Other financial support — especially in the lower watershed — has come from the state’s Salmon Recovery Funding Board and the U.S. Environmental Protection Agency. In 2009, I wrote a story for “Wilderness” magazine about how these programs were bringing “green jobs” to the region. Meanwhile, the U.S. Army Corps of Engineers completed an in-depth study of the river’s ecosystem last year and is now seeking funding from Congress for a series of projects in the watershed. Check out Water Ways, April 28, 2016. To celebrate this milestone for Olympic National Forest, the SWAT will recognize the work at its general meeting Friday at the Skokomish Grange Hall, 2202 W. Skokomish Valley Road. The meeting begins at 9 a.m., and the public is invited.